Set oven control to broil. Spray rack in broiler pan with cooking spray. 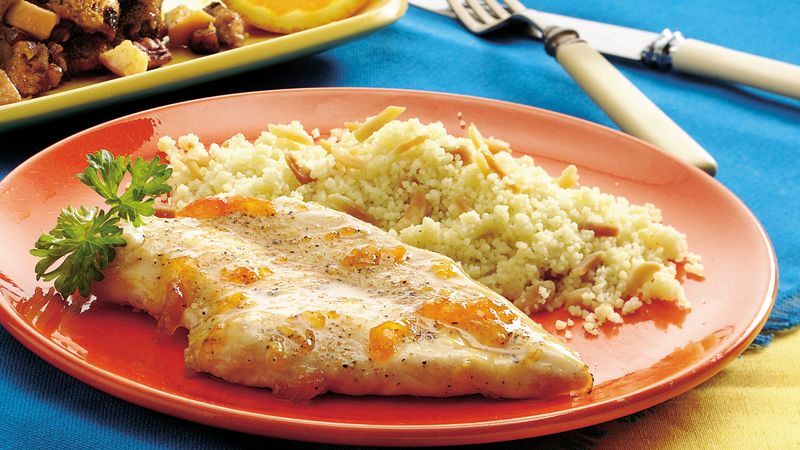 To flatten each chicken breast, place between 2 pieces of plastic wrap or waxed paper. Working from center, gently pound chicken with rolling pin or flat side of meat mallet until 1/4 inch thick. In small bowl, mix garlic powder, pepper and ground red pepper. Sprinkle on both sides of chicken; place on rack in pan. Broil 4 to 6 inches from heat 5 to 7 minutes or until chicken is no longer pink in center. Brush with half of apricot preserves; broil 1 minute longer or until preserves are bubbly. Brush with remaining preserves before serving. Meanwhile, in 2-quart saucepan, heat broth and butter to boiling. Stir in couscous and almonds. Remove from heat; cover and let stand 5 minutes. Fluff couscous with fork before serving with glazed chicken. To toast the almonds, cook them in an ungreased heavy skillet over medium-low heat for 5 to 7 minutes, stirring frequently until they begin to brown, then stirring constantly until they're golden brown. Working from center, pound chicken breast until slightly flattened.